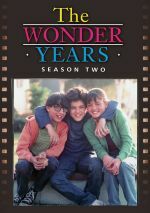 For eons, fans hoped that the much-beloved 1980s “coming of age” TV series The Wonder Years would come to DVD. Because the series used lots and lots of vintage music and the rights to those songs cost lots and lots of money, such a release seemed impractical. Happily, the folks at Time-Life finally made it work, so The Wonder Years arrives on DVD – and with most of the original music intact. More on that subject later. For now, I’ll look through all 17 episodes of Season Two of The Wonder Years. The plot synopses come from the Time-Life website. Heart of Darkness (air date 11/30/88): “Kevin’s nightmares are a telling sign of the new changes in his life, including befriending the tough kid at school.” Even though I went to middle school a decade after this episode’s time frame, our “stoner kids” looked just like Gary: same clothes, same hair, same everything. 35 years later, suburban “bad boys” probably still remain identical. That aura pervades “Darkness” and allows it to become another sold program. Our Miss White (air date 12/7/88): “Kevin develops a crush on Miss White after she has him play the role of Sen. Robert F. Kennedy in a play that she wrote.” I’m many decades from the age of 12, but I can reconnect with those emotions as I watch “White”. Virtually every kid had a crush on a teacher, and this episode represents those feelings well. Christmas (air date 12/14/88): “Wayne and Kevin try to convince their father to buy a color TV for Christmas, and Kevin has to find a perfect present for Winnie after receiving one from her.” After the mild seriousness of “White”, we get a moderately silly show with “Christmas”. I don’t mean that as a criticism, for I like the lighter touch here. Steady As She Goes (air date 1/11/89): “Now that Paul is dating, Kevin begins to pine more for Winnie.” At its best, “Steady” feels like a good synopsis of the bizarre minefield of pre-teen dating. However, it drags a bit and feels somewhat long. Just Between Me and You and Kirk and Paul and Carla and Becky (air date 1/18/89): “It’s a confusing mix-up as to who likes who at Kennedy Junior High.” “Kirk” feels like an extension of “Steady”, so the focus on dating gets a little tedious. Still, it develops the characters in a decent manner, and the quick Star Trek spoof amuses. Pottery Will Get You Nowhere (air date 2/1/89): “Norma is upset when she takes a pottery class and receives encouragement from everyone—except Jack.” While much of Wonder Years remains timeless, its depiction of parental relationships threatens to seem more dated just because those situations have changed a lot over the last 45 years. Still, “Pottery” manages some good observations, and it’s nice to see the parents come to the fore. Kevin’s subplot about his fears of Armageddon works less well. Coda (air date 2/8/89): “Kevin’s piano lessons have him in competition with Ronald Hirschmuller.” Watching this episode makes me glad I took bass guitar lessons – and did so in private. Kevin’s experiences offer a good take on how kids deal with creative impulses and competition. Loosiers (air date 2/28/89): “When Kevin sees that Paul is being humiliated at basketball during gym class, he decides to go to Coach Cutlip to complain about how he thinks teams are being unfairly picked. Cutlip then decides to teach Kevin a lesson about fairness by making him a team captain.” Every adult retains the humiliations of gym class, and “Loosiers” captures those emotions well. It avoids too much sappiness and works well. Walk Out (air date 3/7/89): “Kevin and the student council organize a walkout to protest the Vietnam War. However, when the assistant principal, Mr. Diperna, finds out about the planned walkout, he threatens to suspend all who participate.” Just like we all remember gym class, we can also recall our “cool teachers”. I like that theme, but this show’s Mr. Tyler doesn’t seem all that interesting. That leaves a minor void at the center of the episode, though it’s still a decent program. Nemesis (air date 3/14/89): “Kevin learns the consequences of talking behind other people’s backs.” Like most shows, “Nemesis” hits on social truisms, but it does so in a less deft manner than usual. At times, the show comes across with an Afterschool Special feel. It manages more cleverness and humor than that implies, but it’s not one of the series’ better episodes. Fate (air date 3/28/89): “Driven by his love for Winnie, Kevin faces the school bully.” Usually shows that deal with bullies allow the protagonist to teach the thug a lesson. That doesn’t occur here, which gives “Fate” a refreshing feel. It mixes comedy and drama well. Birthday Boy (air date 4/11/89): “Kevin feels left out when his birthday party is on the same day as Paul’s bar mitzvah.” At times, “Boy” gets sappier than the average episode. Still, it comes with some good emotional moments, so it doesn’t wallow in sentiment too much. Brightwing (air date 4/18/89): “Kevin discovers that Karen is planning to run away to San Francisco.” Karen didn’t get a lot of screentime on Wonder Years, so I like the focus on her, however brief. “Brightwing” itself seems less than stellar, though, so it doesn’t spotlight Karen as well as I might like. Square Dance (air date 5/2/89): “Margaret Farquhar, the class weirdo, tries to befriend Kevin after he is partnered up with her in a square dance for gym class.” Did we learn square dancing when I was in middle school? Maybe, but if so, I’ve blocked the memory. Even without direct recollections of an identical event, I can relate to the emotions displayed here. Heck, I’ve had dates that reminded me of the socially inept Margaret. The realism found here allows this to become a positive program, especially since it doesn’t wrap up the tale in a neat manner. Whose Woods Are These? (air date 5/9/89): “Kevin, Paul, and Winnie come together to stop the destruction of Harper’s Woods. Kevin and Winnie shared their first kiss in these woods, and they all used to play together there when they were younger.” It doesn’t seem like long ago that we had a “civil disobedience” episode with “Walk Out”, so “Woods” feels somewhat redundant. It’s also a step down after the effective “Square Dance”. While it becomes a decent show, I don’t consider it to be a memorable one. How I’m Spending My Summer Vacation (air date 5/16/89): “As seventh grade comes to an end, Winnie’s parents decide to get a divorce, and the kids’ teacher Miss White announces that she is getting married.” I remember the last day of seventh grade. It wasn’t quite as eventful as Kevin’s, so I doubt it’ll inspire too many TV episodes. “Summer” comes across as a little exaggerated but it still captures the spirit of the event and brings us good laughs. Footnote: I alluded to music changes at the start, and “Summer” comes with a glaring alteration, as the use of a generic soundalike for the Doors’ “Light My Fire” becomes a distraction. The episode would’ve worked better with a totally different song than one that sounds like such a clear rip-off. The Wonder Years appears in an aspect ratio of approximately 1.33:1; due to those dimensions, the image has NOT been enhanced for 16X9 televisions. The programs showed their age and tended to be erratic. Sharpness was one of the many up and down elements, as definition varied a lot. Some shots showed nice clarity and delineation, but many others came across as fuzzy and soft. Edge haloes didn’t help; those added a tentative feel to the shows. Occasional instances of shimmering jagged edges popped up, and plenty of print flaws could be found. These varied in intensity, but I saw specks, marks, hairs and nicks along the way; some episodes looked dirtier than others, but none escaped unscathed. Audio quality came across as acceptable. Music showed reasonable pep; the score and songs could be rough at times but had decent range. Effects tended to be a bit distorted but remained passable for their age, and speech was also fine. Though the lines showed more edginess than I’d like and could be somewhat thin, they remained intelligible. Nothing here surpassed expectations but the audio seemed at least average for its era. As I mentioned briefly during the body of my review, the DVD replaces some of the source music found on the original shows. This became nearly inevitable due to the sheer number of songs involved, as the series featured nearly 300 tunes across its six-season run. On Disc Four, we get extras, all of which already appeared on Complete Series package. We start with School Days, a seven-minute, 52-second “roundtable discussion” that involves actors Fred Savage, Danica McKellar and Josh Saviano. They chat about aspects of school sets and their education during the shoot of the series. That creates an unusual and interesting subject that the participants cover well. The Times They Are A-Changin’ fills 28 minutes, 45 seconds with notes from Saviano, McKellar, Savage, co-creator Carol Black and Neal Marlens, key grip Skip Cook, executive producer Bob Brush, producer Bruce Nachbar, and actors Wendel Meldrum, Jason Hervey, Robert Picardo, Dan Lauria, Olivia d’Abo and Seth Green. “Times” reflects the late 1960s social/political climate and the ways the series reflected those areas. The show examines both era and episode issues in a satisfying manner. S2 finishes with cast interviews. Here we find Daniel Stern (30:59), Dan Lauria (20:43) and Alley Mills (33:34). These look at how the actors got their roles as well as aspects of their characters/performances and various experiences. All three offer fine information, though I like Stern’s chat best of all, largely due to his unusual perspective – and I’m glad he explains his ugly beard, too. The set also provides a 16-page booklet. It presents a note from Fred Savage, episode summaries/trivia and credits. The booklet completes the package in a satisfying manner. Fans will debate what era of The Wonder Years fared best, but Season Two seems like a good candidate. It covers the characters’ formative years in a fun, compelling manner. The DVDs provides erratic, mediocre picture and audio along with a few useful bonus features. If you don’t want to shell out for the massive “Complete Series” package, this individual release of Season Two becomes a nice way to continue your collection.